BEIRUT: The dialogue with the Free Patriotic Movement has strategic dimensions, Lebanese Forces chief Samir Geagea announced Sunday, saying the two parties have reached an agreement on several legislative priorities. “The FPM-LF dialogue has begun taking strategic and not merely tactical dimensions,” Geagea told a crowd of party affiliates who gathered in Germany for the annual Lebanese Forces conference in Europe. Speaking to the conference via Skype, Geagea said the “declaration of intent between the two parties was ready and would be announced soon." Officials from the two groups have been meeting for months to prepare for the joint declaration, which will reveal points of agreement between the parties on certain key issues in Lebanon. “We agree on boycotting any [Parliament] session if the electoral and naturalization laws are not on the top of its agenda,” he said. The two parties have also announced their support for extending Lebanese citizenship to expat communities abroad. The move has been mainly championed by Christian parties, given the popular estimation that the majority of Lebanese expats are Christians. Both the LF and FPM are also opposed to the current electoral law, known as the 1960 law, holding that it allows the election of Christian lawmakers by the votes of non-Christians, thus reflecting an inaccurate picture of partisan popularities. 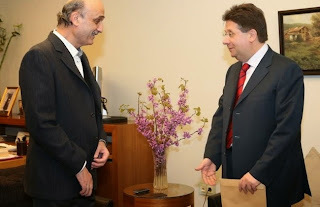 Geagea, who is part of the March 14 bloc, also took on Iran during his speech, accusing the country of preventing the election of a president in Lebanon. “There is an Iranian decision not to hold presidential elections in Lebanon and to keep it as a card to use in a certain deal on the regional level,” he said.